Video is THE medium of today’s generation, when sharing and receiving information! Choose which video(s) to promote and where. Get more targeted video views by placing your video on the homepage of MASTERTUBE.com OR place your video at the top of selected searches to attract more video views from a particular country, specialization or other advanced criteria. Add your logo to MASTERTUBE.com’s homepage logo carousel to generate traffic to your profile or own website. Buy a banner to feature your institution or program. Pay per 50K, 100K or 150K impressions. Banners differ in price and size. 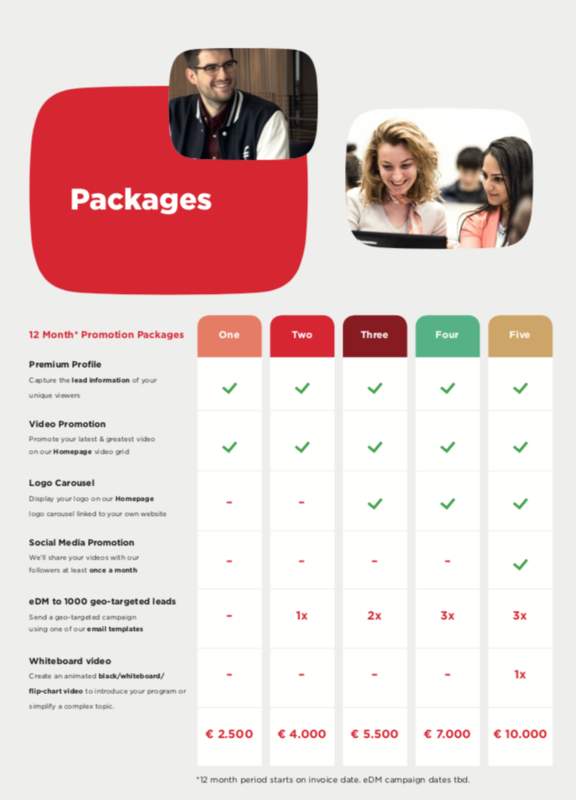 Upgrade to a ‘Premium Profile’ and capture the information of your viewers. Allow your video viewers to download your brochure or schedule a personal video call. Invite us to your campus to create a promotion video for your MASTERTUBE.com profile OR let us help you produce a unique and cost effective school branded video to share with your online community. Create a whiteboard or animated video to simplify complex topics.